The player takes control of a faerie avatar and is quickly educated on the bounds and limits of their agency. Utilizing the PS Move controllers as the left and right hand, they’ll explore the tranquil manse, seek out and engage the distracted young dwellers, and slowly become embroiled in their intrigues. While the avatar can move and interact with objects, the majority of the game is experienced in a time-frozen state, which feeds into some overarching stillness theme while also serving to keep the game engine from reaching anything even close to frantic. So, yes, the game is extremely slow-paced, with teleportation movement to the frequent standard in VR games of this ilk, as well as a crouch and focus function to hone in on bespoke points of interest. 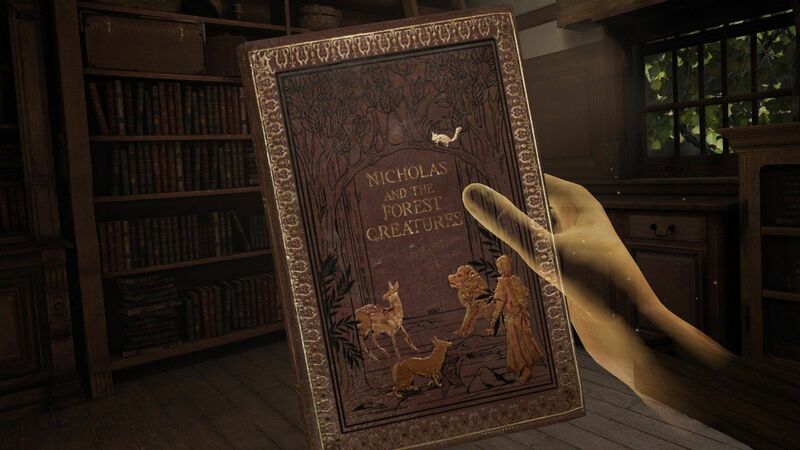 Interactivity is fairly mundane throughout, with the player using keys, opening drawers, rooting out arbitrary collectibles, and fussing with basic inventory puzzles to keep the story moving. Nothing too exciting, and Déraciné doesn’t really put its best foot forward, with any available early-game drama always feeling enigmatically out of reach. Then again, it is a Miyazaki game, which means the darker edges of the plot eventually reveal themselves to attentive players, even managing to recontextualize previous scenes and situations that are less innocent than they first appear. Discussing the narrative in any greater detail than that risks spoiling it, but it’s downright spoonfed in comparison to Dark Souls or Bloodborne. Additionally, it’s a time travel story, which somehow doesn’t lock gears until about the halfway point, when circumstances and echoes draw out the most important realizations to light. By that point, you’ll probably have grown quite fond of the characters and their detailed tragedies and motivations, despite the many larger questions which loom after completion. Déraciné’s time travel aspect isn’t a secret, really — chapters are always separated by an interstitial screen which specifically shows one date/ timestamp, then another — but the broader goals are so mercurial that recognizing the significance of this plot device takes considerable time, like anything else in the game. The aesthetic qualities are generally strong, despite some expected muddled textures in certain areas and environments. The symphonic score is ruefully dark and quite effective, though rarely memorable, persistently weaving its motifs through every chapter’s range of moods. Whether or not the character performances are to a player’s perference, they’re consistent and idiosyncratic, even while much of the lip-syncing seems off, further exacerbated by the close proximity of the VR perspective. Also, the characters have that slightly odd, glazed doll-like quality that feels endemic to certain Miyazaki games, but this still seems like a deliberate stylistic choice. Déraciné feels decidedly on-rails, and the entire map of the boarding school is never offered up for exploration all at once, with chapters locking doors or blocking off entire wings and hallways, bottle-necking the player into the most obvious set of choices. Maybe this is to keep players from distracted meandering, but it works to make the surroundings feel less absorbing, which seems counterintuitive and shrinks the possibility-space. Similarly, the puzzle-solving portions rarely offer a diverse set of options, boiling down many solutions to the reductive “try anything until something clicks” variety; early in the game the player will probably be thankful for that, since they may barely comprehend their goals to begin with. After that halfway mark, though, they might feel reigned in and even powerless by the scarcity of options, which can feel frustrating. 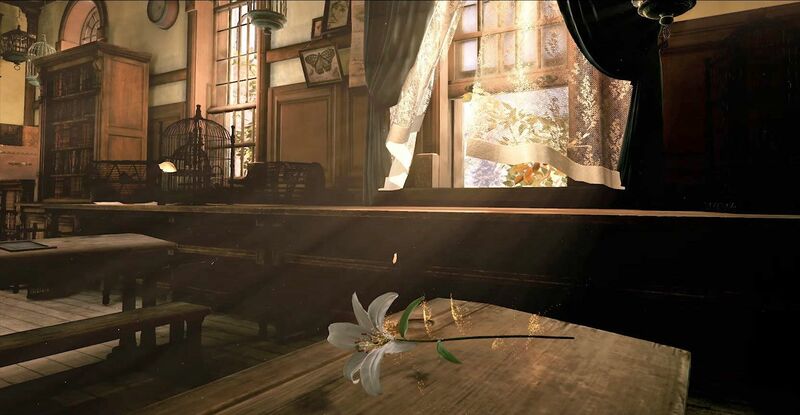 Still, Déraciné is an artistic experience crafted under the eye of one of the most beloved and trusted craftsmen in the business, so it’s hard to root out any intentional design errors in the game or fumbling points in the story. Taken as a whole, it’s a successful experiment, even when certain details get in the way or work to compromise the player’s agency. There’s also a subtle Bloodborne easter egg to divine, which will throw some players into lore convulsions about whether or not the game takes place in the same corner of the Miyazaki-verse. For adventure gamers and dark fantasy fans looking for new PS VR experiences, exploring Déraciné’s world is the perfect way to spend an autumn afternoon. Déraciné is out now on PlayStation VR for $29.99. A digitial copy was provided to Screen Rant for purposes of review.